ELVA PPC-10G 10Gbps wireless MMW link has been presented to German telecom operators and ISPs in a joint seminar held by TWS Technologies GmbH & ELVA in Velbert, DE. 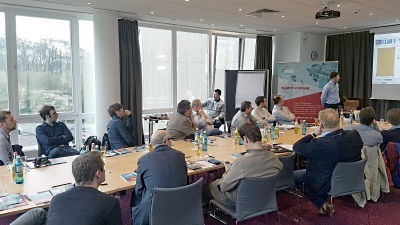 On April 2017, ELVA and TWS Technologies, the German division of Dutch-based TWS Group held a joint seminar for German telecom operators and ISPs on new opportunities opened by the ELVA PPC-10G 10Gbps wireless link. A live link with 10 Gbps demo traffic was presented for the seminar attendees, with a trace from the roof of the Best Western Plus Parkhotel Velbert (Günther-Weisenborn-Straße, 7) to the city TV tower at a distance of 1km. The transceiver on the TV tower was installed at a height of 72m. The presentations at the seminar were focused on reviewing the current market of ultra-wideband 10 Gbps wireless equipment and innovative specs of the ELVA PPC-10G 10Gbps wireless millimeter-wave link. Daniel Weber from TWS Technologies and Harris Cains from RF Com presented their companies and their involvement in the ultra-wideband communications business. Other presentation were devoted to the German rules on licensing of 71-76/81-86 GHz (E-band) and the market prospective for 5G/4G+/LTE-A E-band wireless backbones. Harris Cains also presented the ELVA PPC-10G 10Gbps wireless MMW link in detail, with its web-based interface and the link budget calculator. Earlier in Feb to Apr, 2017, TWS Technologies division in Twello (The Netherlands) had fulfilled a series of extensive tests of the ELVA PPC-10G 10Gbps wireless MMW link according to RFC2544 methodology. The distances that were used were - 1km/2km/6.15km. While 6.15 km from Twello to Deventer was the longest one, it was confirmed 9999,6 Mbps throughput, 50 μs latency and zero frame lost for 6.15 km distance. The review on these tests were published at http://www.prweb.com/releases/2017/04/prweb14256175.htm with photos and full RFC2544 report. The PPC-10G broadband link provides full-duplex data rates of up to 10 Gbps in a single, zero-footprint, all-outdoor solution. Among ISP applications, the link is intended for Security/Safe City applications, 5G/4G+/LTE-A Backhaul, Corporate Campus Networks, IPTV. This 10 Gigabit millimeter wave (MMW) technology is the best choice for wireless connectivity on distances over 1 mile where fiber is not available or its ownership / rent is overpriced. TWS technologies GmbH offers competence for your radio or mobile radio projects. Would you like to connect two sites with radio? Or are you looking for an alternative to an expensive landline connection? Then TWS technologies is your contact for the realization of suitable solutions for your network.